In front of an amped up Anfield, proceedings got off to the best possible start when Naby Keita, making his second consecutive appearance in a red shirt, fired home from the edge of the area courtesy of a deflection after just five minutes. Nerves? What nerves! That early goal lifted any apprehensions from the players, and it was hardly a surprise when Roberto Firmino tapped home 20 minutes later following sublime work on the wing by Trent Alexander-Arnold. Indeed, the biggest shock was that we didn’t extend our lead further, and while Porto created a few half chances – Moussa Marega was the chief culprit of their profligacy – they never seriously threatened. For a last eight match in the Champions League, it was as comfortable as we could have expected, and sets us up for the second leg next week absolutely perfectly. Understandably, Jurgen Klopp was delighted afterwards. “We are happy, it is the first leg and it will be an intense second game. We scored two goals and controlled the ball most of the time,” he said. All of which sets us up rather nicely for a return to domestic action on Sunday, where Chelsea will be the visitors to Anfield. Once again, it will be a chance to maintain our two-point cushion, at least, over Manchester City, who travel to Crystal Palace earlier in the day. The beauty of cantering to victory is that you can hook some players off and give them a rest; as Klopp did with Sadio Mane and Roberto Firmino on Tuesday. And with Andy Robertson suspended for the Porto game, he should return on Sunday full of beans following his night off. 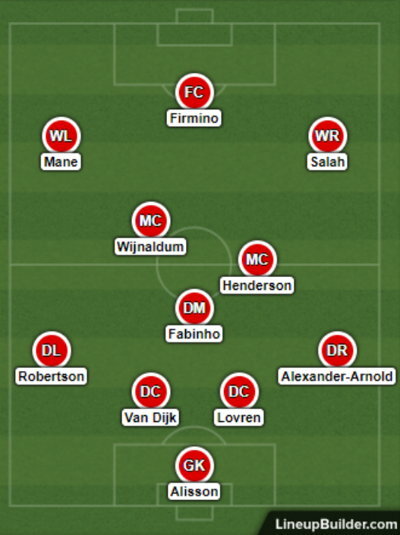 There was a really nice balance to th midfield against the Portuguese outfit too, with Fabinho sitting deep and breaking up attacks and allowing both Jordan Henderson and Naby Keita push forward at will. Henderson in particular was outstanding, and he has been given a new lease of life in the ‘number eight’ role. You suspect the manager will be reluctant to leave him out against Chelsea, although Keita – who hasn’t many minutes under his belt this term – might be given the afternoon off given his recent workload. At the back, Dejan Lovren came in for Joel Matip – perhaps a nod to Porto’s high ratio of goals scored from set pieces, and the Croatian arguably did enough to keep his place for Sunday. There was a time earlier this season when there were doubts that Maurizio Sarri’s first campaign as Chelsea manager would even see April. But the Italian remains in charge, and the Blues have kicked on of late with three straight victories: defeating Cardiff (2-1), Brighton (3-0) and West Ham (2-0). We offer a few caveats, though. Firstly, those teams are hardly the cream of the Premier League crop. Secondly, Chelsea’s away record reflects their inconsistent campaign: W9 D1 L6. It would be foolhardy to write them off, but this isn’t a vintage Chelsea side by any means. The Blues may have turned a corner of late, but you don’t have to have the best of memories to recall a time when they were getting thumped away from home. There were 0-2 defeats on the road to Everton and Arsenal, 0-4 to Bournemouth and 0-6 to Manchester City, all since January. Yes, we accept they are in a better place now, but that shouldn’t overshadow the bare facts. Liverpool are priced at around 8/13 to win this one, and you might make the argument that those odds are about correct. Take Eden Hazard and N’Golo Kante out of the Chelsea side and you have a fairly mediocre outfit. We have been defensively very good on home soil this term – just 10 goals shipped in 16 Premier League outings at Anfield, and Chelsea have only netted 23 on the road so far; only Wolves have scored fewer in the top half of the division. All of which is a roundabout way of saying we think Liverpool will win this game to nil; a very attractive option at 19/10.